DNA ligases are essential enzymes for DNA replication, repair, and recombination processes by catalyzing a nick-joining reaction in double-stranded DNA. 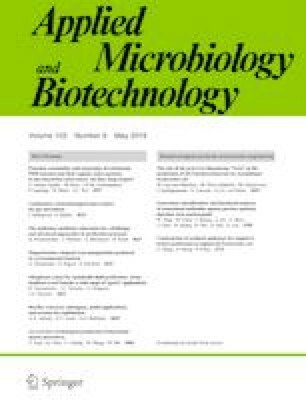 The genome of the hyperthermophilic euryarchaeon Thermococcus barophilus Ch5 encodes a putative ATP-dependent DNA ligase (Tba ligase). Herein, we characterized the biochemical properties of the recombinant Tba ligase. The enzyme displays an optimal nick-joining activity at 65–70 °C and retains its DNA ligation activity even after heated at 100 °C for 2 h, suggesting the enzyme is a thermostable DNA ligase. The enzyme joins DNA over a wide pH spectrum ranging from 5.0–10.0, and its optimal pH is 6.0–9.0. Tba ligase activity is dependent on a divalent metal ion: Mn2+, Mg2+, or Ca2+ is an optimal ion for the enzyme activity. The enzyme activity is inhibited by NaCl with high concentrations. Tba ligase is ATP-dependent and can also use UTP as a weak cofactor; however, the enzyme with high concentrations could function without an additional nucleotide cofactor. Mass spectrometric result shows that the residue K250 of Tba ligase is AMPylated, suggesting that the enzyme is bound to AMP. The substitution of K250 of Tba ligase with Ala abolishes the enzyme activity. In addition, the mismatches at the first position 3′ to the nick suppress Tba ligase activity more than those at the first position 5′ to the nick. The enzyme also discriminates more effectively mismatches at 3′ to the nick than those at 5′ to the nick in a ligation cycling reaction, suggesting that the enzyme might have potential application in single nucleotide polymorphism. Haoqiang Shi and Yanchao Huang contributed equally to this work. The online version of this article ( https://doi.org/10.1007/s00253-019-09736-9) contains supplementary material, which is available to authorized users. LZ, ZY, and PO designed experiments; HS, YL, QG, YH, MR, HC, and CT performed experiments; LZ, ZY, HS, and YH analyzed data; LZ, ZY, and PO wrote and revised the paper. This work was supported by the National Natural Science Foundation of China Grant (No. 41306131) to L.Z., the Academic Leader of Middle and Young People of Yangzhou University Grant to L.Z. ; the practice innovation training program for college students in Yangzhou University to H.S. (No. XKYCX18_072); the National Natural Science Foundation of Jiangsu Province (No. BK20180937) to C.T.